I was interviewed by Lillian Brown, a Globe correspondent, regarding my use of Instagram as an artist. I was happy to relay my experience in becoming an artist and using Instagram as a great marketing tool. What fun it was being asked to provide the cover art for the weekly TOURIST NEWS published in Kennebunkport, Maine. I appreciate gracing the cover and hope I may get to share more of my seasonal work inspired by my home state of Maine. 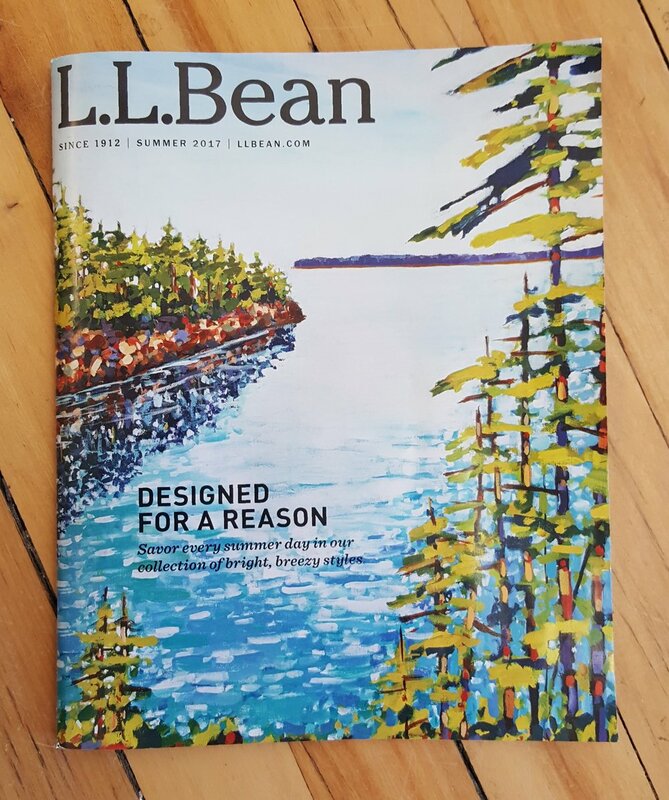 I am beyond excited and honored to have one of my paintings of Wolfe's Neck Park (Freeport) grace the cover of this year's 2017 LLBEAN Summer catalog. If you didn't get one, you can call the catalog department at 888-731-3208 to get your own copy. I am making it a priority to attend as many "First Thursday" gallery shows as I can. I enjoy connecting with other Art Collector Maine artists as well as meeting collectors of my work. This even occurs on the first Thursday of every month at 152 Middle Street, Portland Maine. I am always so excited to see my work in print!! I am excited to announce that I will be displaying my work (upwards of 15 pieces) at the five-star Nemacolin Resort in Farmington, PA. I plan to provide winter pieces as well as forest and autumn work to help usher in the fall and winter season at this amazing resort. Expected display will run from October 1 to Dec 31, 2018.